Work for a cool company? Own one? All work and no play make for team members that won't be around long. 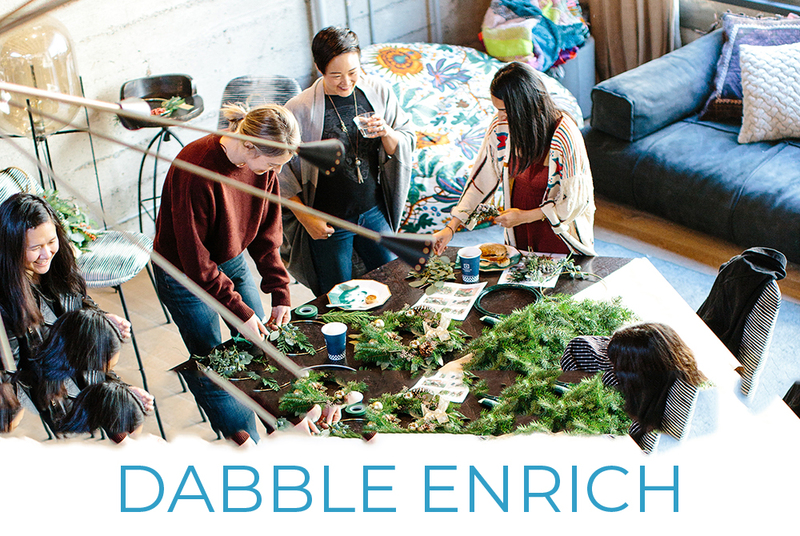 Invest in your team by setting up Dabble Enrich Accounts for employee enrichment and engagement through Dabble. We'll cater and create a continuing education and development program that fits your budget and presents your team members with dedicated spending to take any class or local experience that interests them, professionally or personally. Leave the booking, payment, and reporting to Dabble. Not ready to take the dive into Dabble Enrich accounts for your team? No problem, we've got you covered! Keep team energy high with team building workshops, and hands-on off-site experiences they'll actually look forward to with the support of Dabble. Whatever your needs - from team building to health and wellness services, Dabble experience partners will do the work to make your team building and corporate events run smoothly. Keep your employees healthy, happy and productive with Employee Enrichment & Engagement experiences by making a team building event request here. Flexible continuing education and development program for employee enrichment and engagement. Employee accounts can be created with any amount from $10 to $100 per month for booking local classes and experiences. Dabble Enrich sparks creativity and challenges your team to think and learn outside of the box. Support local makers, creators, artists, and entrepreneurs while inspiring, engaging, and enriching your team. We’re ready when you are to explore the next steps of setting up Dabble Enrich accounts for some or all of your team. Set up an enrichment program for 25-49 employees and save 10% off your first year. Set up an enrichment program for 50-99 employees and save 15% off your first year. Set up an enrichment program for 100+ employees and save 20% off your first year. Program Details: If you decide to extend the program for an additional year, up to 50% of the Dabble Enrich credits can roll over to the next year. However, if the program is ended, all credits must be used with the program year. There is no cost to set up the program and we can have your company's enrichment accounts set up in just a few days. Have questions? Want to discuss a benefit plan for your team? Drop us a line! We’re here to answer your questions!